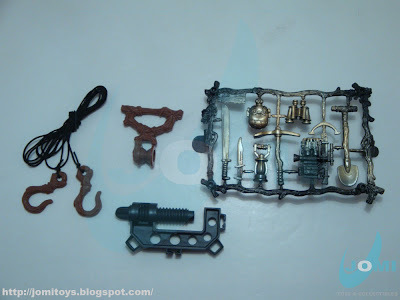 Besides the size and multiple items included, the set itself is a heavy one (almost 5 lb, 2.2Kg) , thus making it another of the "with handle boxes". View of all box contents. 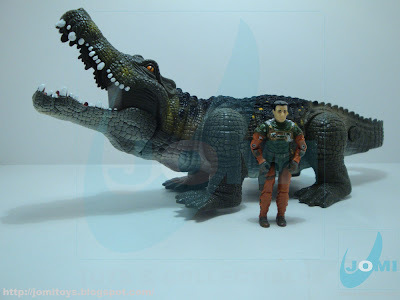 Figure: Strangely, given the size of the playset, just one, but the greatest one, "Hefty Nicky". 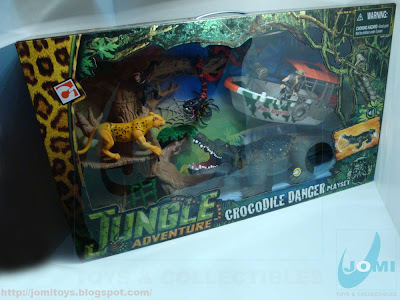 For more details on this wonderful figure, refer to "Jungle Adventure Wild Jungle Playset - Hefty Nicky". Leopard. Apparently. 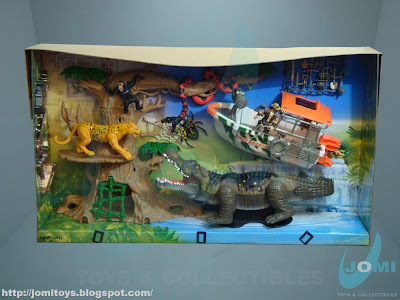 Although too big for a 1:18 scale set, when compared to the "Jungle Adventure Jungle Trekker Playset", its size is almost acceptable. Almost. 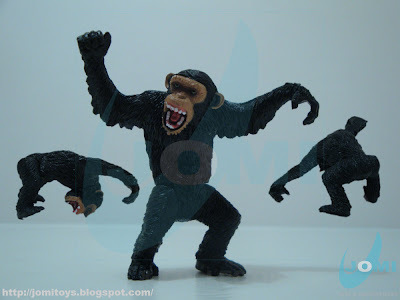 The chimpanzee. Decent size, great sculpt. 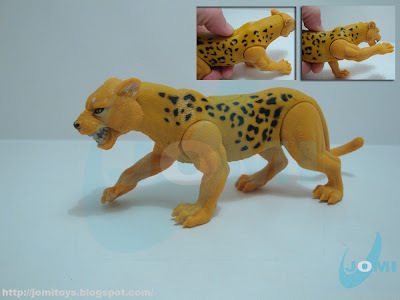 Lack of articulation to the upper members, other than that, a great addition for a jungle dio. A recovered figure from previous Chap Mei Jungle sets. The spider. 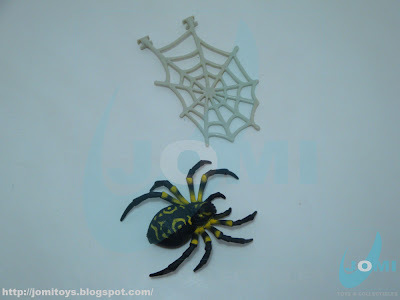 Also too big for the 3 3/4" figure´s scale, it´s about 1/3 of the "Knights Spider Attack Playset" Shelob-looking spider. 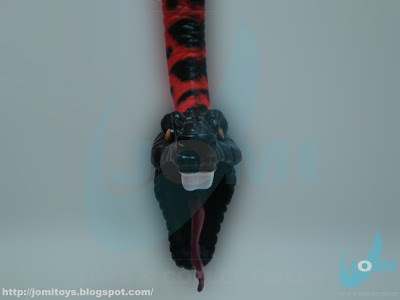 The snake. In size, could be used as an Anaconda, although the teeth had to be re-designed, or a really, REALLY big Python. "What´s up Doc?" ... someone forgot to cut between the fangs! The tree! At first glimpse, a must-have! When you have a second look at the plastic and overall presentation, it looks like a Smurf´s home. When you start looking at the details and possibilities... your thumbs are up and you feel grateful you have it. First of all, it´s really big. It gives you that sense of a centenary tree with a lot going on there. 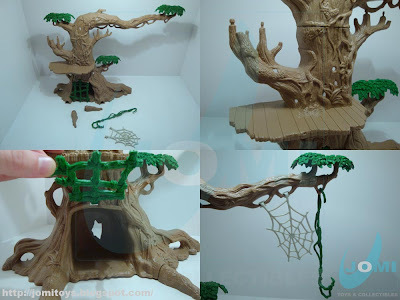 You get a platform halfway to the top, means to set a web or the vines, and the cavern-looking "prison" tree hole. And the pins to hold stairs, making it interconnectable with other sets. View with all animals standing. 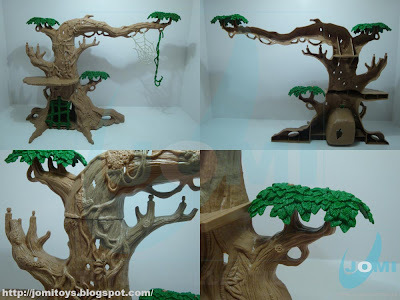 Unfortunately (as it´s also understandable) the tree is hollow on the "hidden" side. Definitely made to be used - face front - solely, its best side has a lot of perks, such as the body sculpting (vines, holes, branches) and leaves. This one was also created towards action. 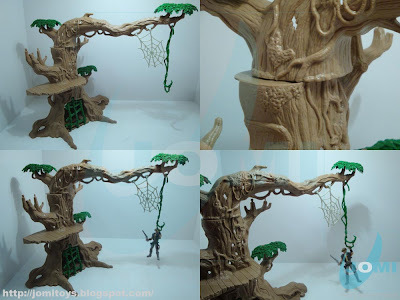 The top portion rotates 180º to swing figures around like Tarzan. 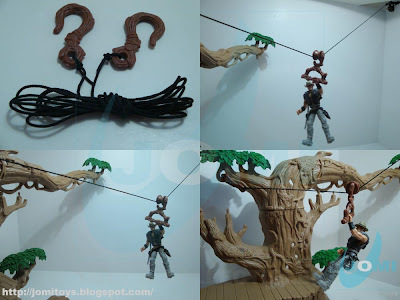 Another great detail is the Abseiling action. Comes with 2 hooks and a rope(made with a very nice braided nylon wire). 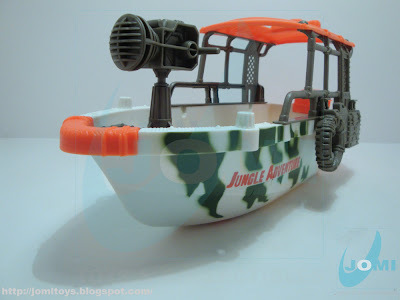 The river boat. I was hoping this vehicle was more detailed. But I believe we´re about to see a lot of this one in the future. 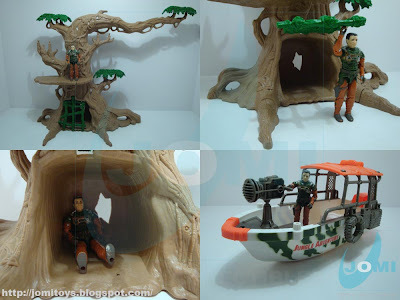 Soldier Force version, a MUST. 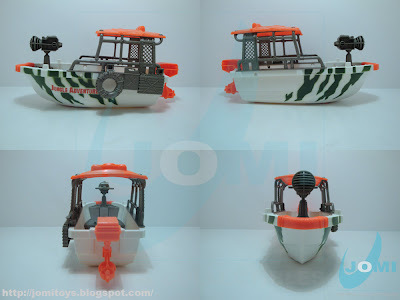 This looks like a Vietnam war river patrol boat. And if you thought some of the previous animals were big, get ready for the ultimate extravagance! Christened by one of our team members, the "Crocosaur", this reptile puts the 18 ft, 2200 lb Saltwater Crocodile to shame! 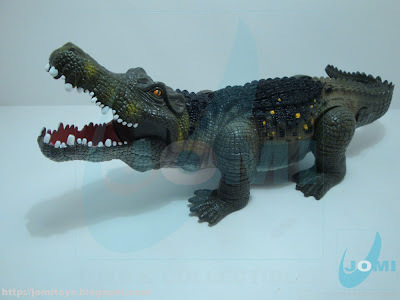 Electronically equipped, when the button is pressed, the "Crocosaur" roars and walks (like a Zoid) forward. 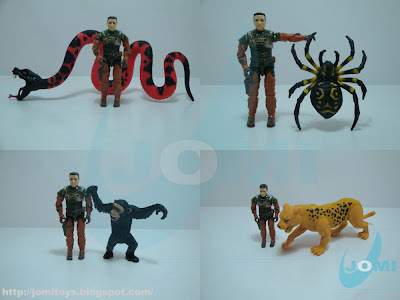 Scale shots with included animals and (not included) RAH G.I.Joe and website vet star, "Altitude". 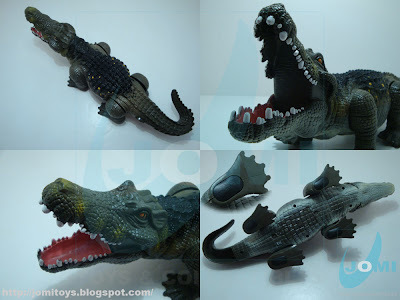 CROCOSAUR! 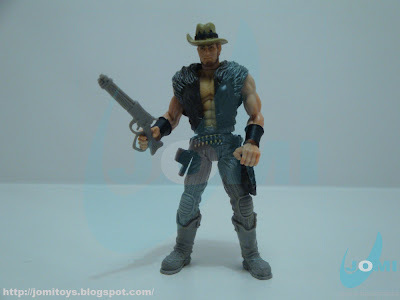 Entertaining and considerably well sculpted, this was more towards the 12" G.I.Joe team. A curious detail on the animal´s size needs. So big it requires its own base. 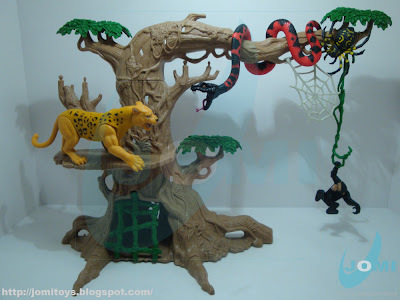 This Jungle Adventure set is just amazing. 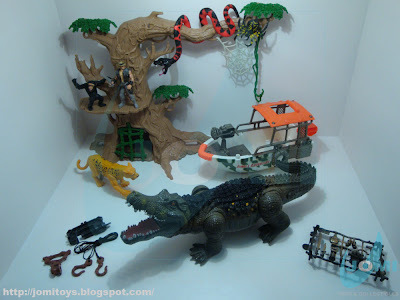 The tree can be used in diorama pictures, the Crocodille would be useful for my Croc Master. Even bigger than a real one you can see Mindbender experiments being done on him. 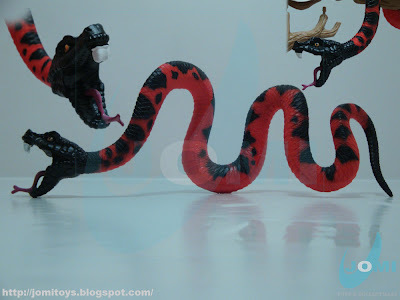 The snake would be great as a Cobra Commander's pet and the boat with some paint can become a Joe or Cobra patrol boat. 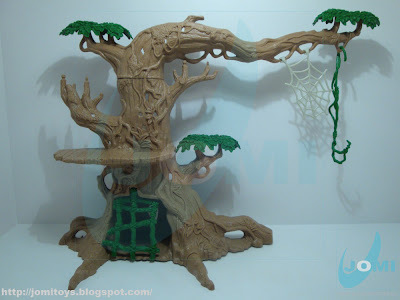 is this playset still available on the market? I want it so bad! Hey there! 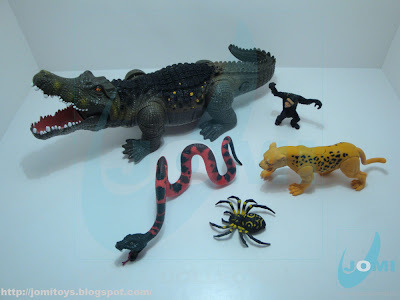 This set is no longer available but it occasionally pops up in Europe for US$75 or so. It´s also big and heavy, so it would be shipped for over US$70 too. Assuming of course, you live outside Europe. 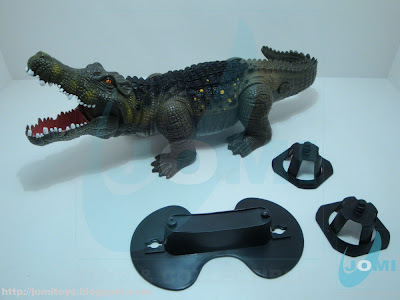 Is there any way to just buy the Croc?